3A Certified Sanitary Hydroheater - Hydro-Thermal Corp. The Sanitary Hydroheater is a perfect fit for applications in the food & beverage and pharmaceutical industries. The Sanitary heater is 3A Certified making it the heater of choice for processes that require fast and precise temperature control without any degradation in quality. The Sanitary Hydroheater® is a sophisticated heat transfer device capable of 100% heat transfer efficiency and precise temperature control. It employs a unique internal geometry to control the steam injection process. 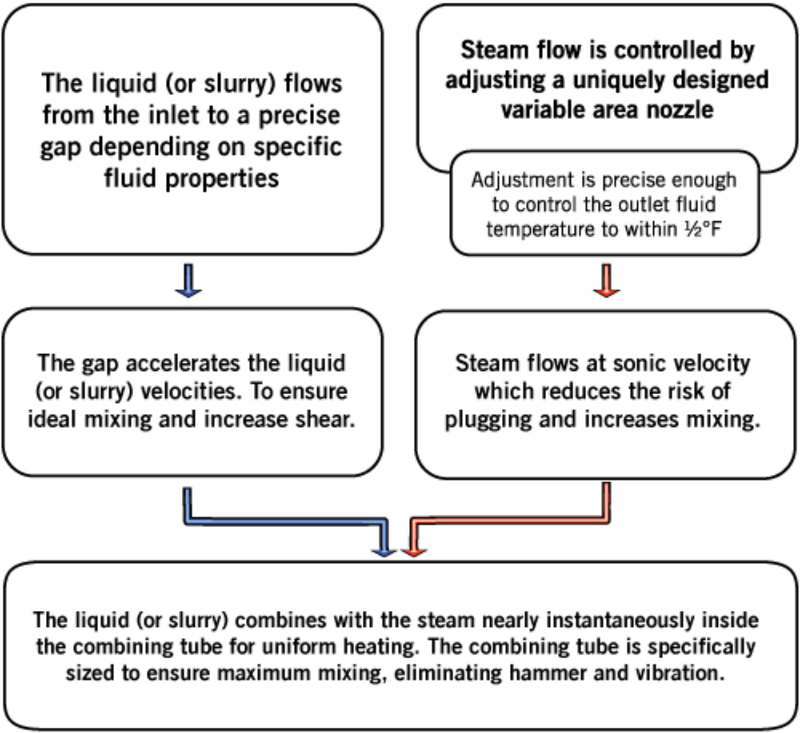 A variable area nozzle/stem plug is used to precisely regulate steam flow. The steam condenses and disperses into the liquid so quickly that hammering and vibration often experienced with less sophisticated heaters are virtually eliminated. The high steam velocity turns the Sanitary Hydroheater into a self-cleaning machine, ensuring that internal surfaces will not plug or foul regardless of the product being heated. Meet 3A specifications for sanitary use self-draining from multiple orientations. Steam and liquid inlets can rotate 360 degrees. The unit will drain in a vertical position. Sealed for external wash down. Can be assembled or disassembled quickly with no special tools required. Precise temperature control Sanitary heaters provide precise temperature control to +/1ºF [0.50°C] with maximum temperature rise up to 200°F [93°C]. Fast, efficient sanitary heaters offer quick heating with no warmup time needed and 100% thermal efficiency. 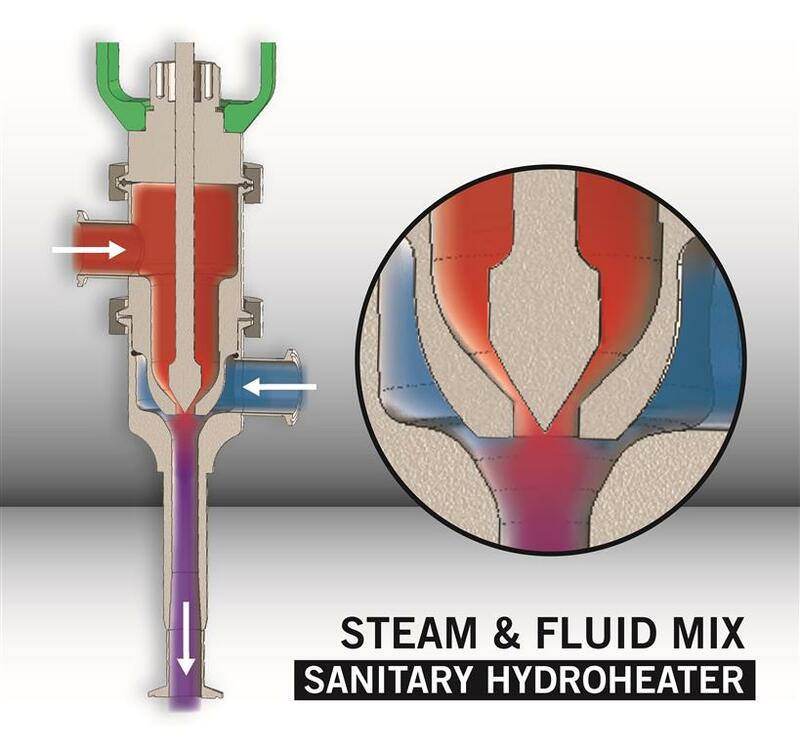 Rapid heat transfer causes steam to be dispersed into the liquid quickly, eliminating hammer and vibration associated with less conventional heaters. No multiple holes to plug or foul. Five different sizes (for 0.5", 1", 1.5", 2", and 2.5" connections) can accommodate flow rates up to 180 gpm [41 m³/hr], steam supply pressure up to 150 psig [10 bar] and steam flow rates up to 13,000 lbs./hr. with a maximum temperature rise to 200°F [93°C]. Heats water and many types of liquid mixtures. The Sanitary Hydroheater is made for your specific operating conditions. We need to know a little bit about your process and plant set-up in order to design the heater or skid that will work best for your conditions. Please fill out this form or contact us here.